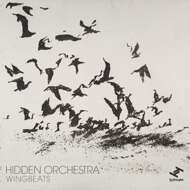 Wingbeats is the eagerly awaited new release from Hidden Orchestra, on Tru Thoughts. On the 7-track EP, which illuminates the fascinating intricacy of Joe Acheson’s work, the immersive lead track is accompanied by several of the original source compositions which fed into its creation. Rich in detail and character, field recordings intertwine with drums, percussion and eclectic instruments including piano, electro-harp, glockenspiel, Turkish mey and cello. “I have found that what draws me to a piece can often be one small detail – a single characteristic or maybe a fleeting moment of beautiful sound or compelling rhythm”, says Acheson. “So, for a Hidden Orchestra composition I often create lots of individual source pieces and pick out bits to reinterpret as samples”. Although they were written to be source material for sampling, the source pieces included on the “Wingbeats” EP stand on their own as individual compositions, with striking elements which can easily get lost in the full texture of the main track. Each source track tells a story: of birds fluttering in to feed on toast and cheese crumbs in a rural British garden, or flocking in a hedge in the snow in the French Alps, of an imaginary string orchestra, of an early-hours improvised piano jam, of a spot of instrument shopping while on tour in Istanbul, or an early-morning dawn chorus in a sleepy village, rounded off with church bells. His recordings, and the hundreds of live gigs that Hidden Orchestra have played across great swathes of the world, have earned praise from the likes of The Independent to XLR8R to BBC 6Music, this adds to Acheson’s parallel career as an award-winning producer of radio programmes and soundtracks.